Should You Use Copper Grease/Slip/Anti-Seize on Spark Plug Threads? With it being one of the most asked questions on the internet when it comes to spark plug changes, we wanted to make things far clearer. With even walk-in stores trying to use this as a tactic to sell their copper grease products, we dig to reveal the truth. So what what is actually correct and what’s wrong? NGK spark plugs feature what is known as ‘trivalent plating’. This is a silver-or-chrome coloured finish on the threads that is designed to provide corrosion resistance against moisture, chemicals and weathering. The coating also acts as a release agent during spark plug removal. NGK spark plugs are installed at the factory dry, without the use of anti-seize. 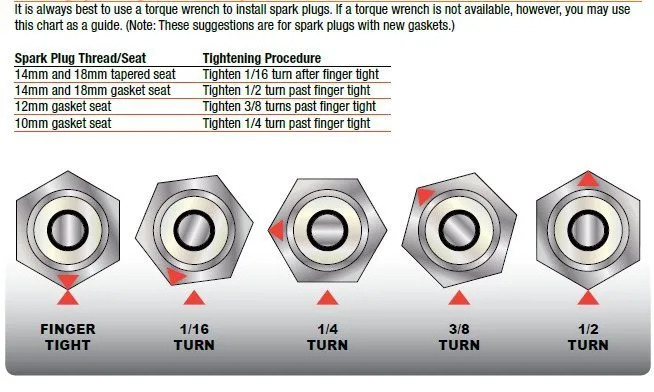 NGK tech support has received a number of tech calls from installers who have over-tightened spark plugs because of the use of anti-seize. Anti-seize compound can act as a lubricant altering torque values up to 20 percent, increasing the risk of spark plug thread breakage. Why Do Torque Values Change With Copper Slip? 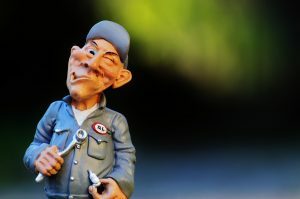 The reason is because there’s less friction between the two materials and far more force can be applied into the plugs preload when using thread compound or copper grease. The preload is the ‘tension’ between the plug and cylinder head threads that gives the friction force to stop them coming loose. You will end up over-tightening them by up to 20% which is easily enough to break them if using an anti seizure agent. This goes for anything and everything to do with torque-wrenches, always use torque specifications ‘dry’ unless stated otherwise. For NGK warranty purposes we must send all damaged plugs back to them to be officially examined and documented. 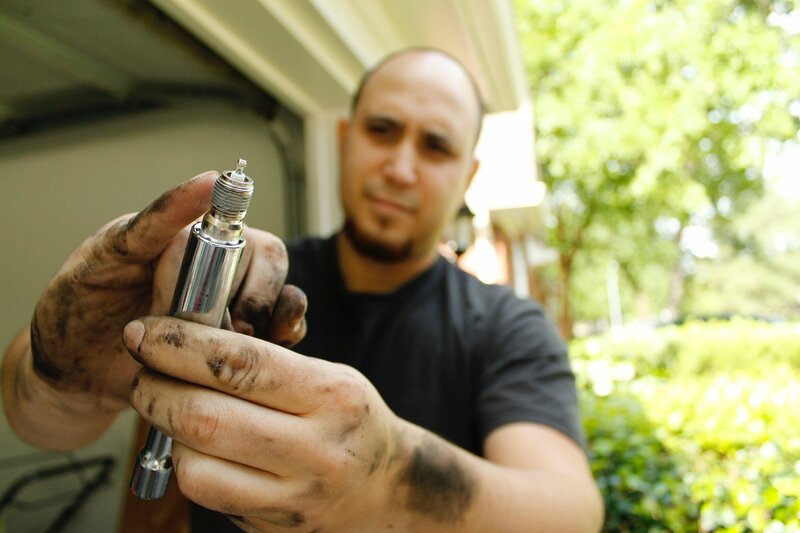 As of now, it turns out 100% of the spark plugs in the last 3 years that were returned due to breakage were the result of customers using thread compound and simply over tightening with a torque-wrench. The NGK warranty reports are always compiled of detailed photographs pinpointing the reasons of exact failure, even to the very smallest of details such as hex swelling is recorded. But I Know a Mechanic Who Always Uses it on Spark Plugs? If your mechanic uses copper grease on spark plug threads well as torquing them down, then be warned! NGK is adamant this procedure should be avoided on all costs. We must remember that the spark plug manufacturers are the most experienced out of all of us, with millions of pounds spent on R&D and hundreds of qualified mechanics testing them day in, day out. 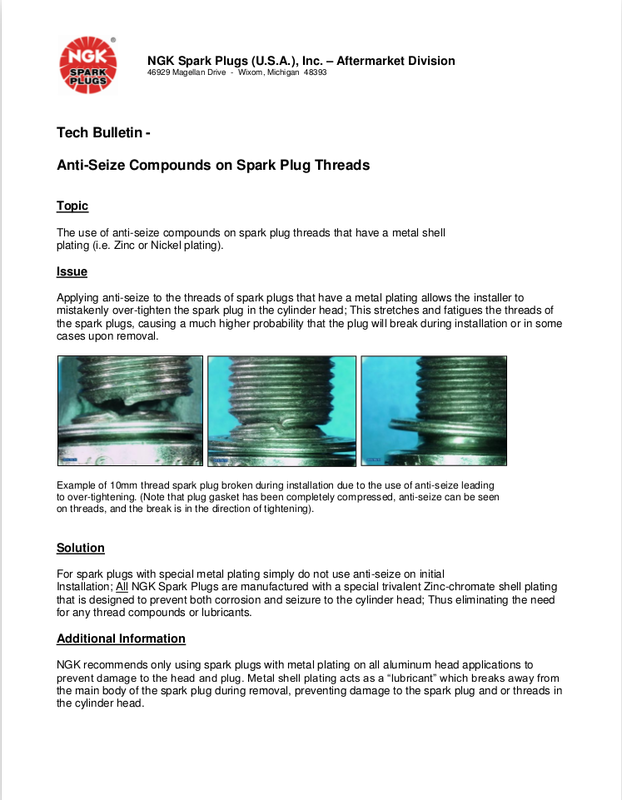 NGK released an official tech bulletin to all suppliers about the issue with copper slip. 1. 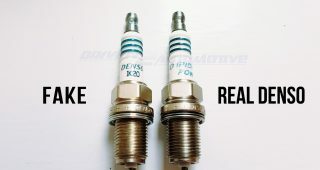 Locate the spark plug covers and remove them by pulling them upwards. 2. 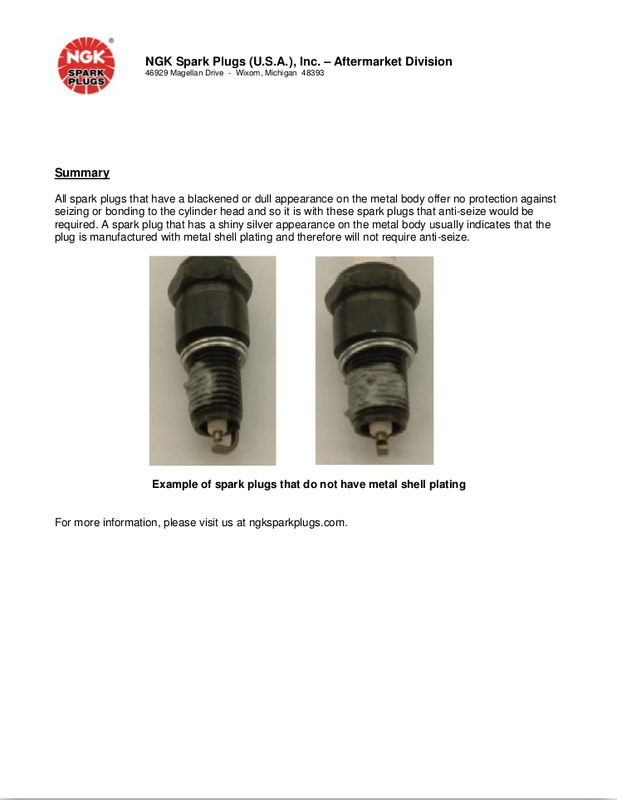 Blow away any debris from the plugs recess area and carefully undo the old spark plugs with the correct sized socket that is specially made for spark plugs, they are usually much longer than standard sockets. If they feel seized it’s advised to use an impact wrench at a low torque setting to ‘shock’ the plugs free. Try not to use penetrating lubricant as once the plugs are removed any dirt and fluid can run into the cylinders. 3. After removing the old spark plugs, check the condition and cleanliness of the cylinder head threads, if they’re dirty then this can lead to inaccurate torque wrench readings, it is paramount however that care must be taken so no dirt falls into the cylinders, some kitchen roll and a little carb cleaner sprayed onto it should do the trick. 4. Ensure the plug is gapped according to the vehicle manufacturers specification. Multi-ground electrode and precious metal plugs (iridium, platinum tip etc) should not be re-gapped due to risk of damaging the fine tips. 5. Warning – Do NOT apply copper grease/slip or anti-seize to the plug threads, copper grease is only for used on old fashioned black spark plugs which have no corrosion resistant zinc plating. NGK does not recommend the application of lubricant such as copper grease to spark plug threads as the result is a reduction of frictional forces at the thread faces. This will render the torque readings inaccurate and over tightening could occur by up to 20 percent! It’s very important not to over or under tighten spark plugs during installation. Over tightening can lead to distortion of the spark plug and breakage. Under-tightening can cause overheating due to poor heat dissipation and in extreme cases can cause spark plug breakage and/or major engine damage. 7. 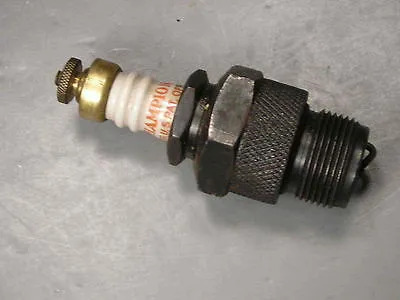 If your engine has the more modern ‘COP’ system (coil-on-plug) then lube the spark plug boot with dielectric grease, this helps prevent misfires and makes removing easier in the future. 8. Fire up the engine and listen to that sweet symphony!